Gaining insights quickly from your data becomes more challenging as the volume, velocity, and variety of that data increases. To streamline the process, scale the capacity, and reduce the costs of capturing and analyzing this content, organizations need to modernize their data warehouse solutions. Cloudwick is an advanced consulting partner for Amazon Web Services (AWS) with the Big Data Competency, and an AWS Partner Network (APN) featured APN Partner for data lake and data warehouse modernization. A review of this solution architecture will demonstrate the breadth and variety of oﬀerings that can be delivered with AWS and AWS Marketplace providers like Cloudwick. The solution provides a full spectrum of integrated options, including data ingestion from a variety of data sources, data management, data cataloging, and analytics, as well as report generation and visualization. Cloudwick’s consulting experts can guide you through the process, accelerating your time to analytical insight by swiftly and safely architecting a modern data warehouse on AWS. They will lead the deployment of a data lake foundation, and can leverage their big data expertise to integrate a wide variety of AWS resources, as well as third-party ISVs and tool vendors. Cloudwick has worked with AWS to package a discounted and time-based oﬀering to jumpstart your journey to a modern data warehouse. This Jumpstart oﬀer starts with an onsite kickoﬀ and use case requirements gathering session, and covers end-to-end modern data warehouse implementation. Learn more about the Jumpstart consulting oﬀer objectives, key activities, services included, and customer expectations here. Unlock insights and reduce costs by modernizing your data warehouse with an AWS Partner. In this whitepaper, we have compiled the essential information you need to take advantage of AWS services for your data warehousing and analytics needs. 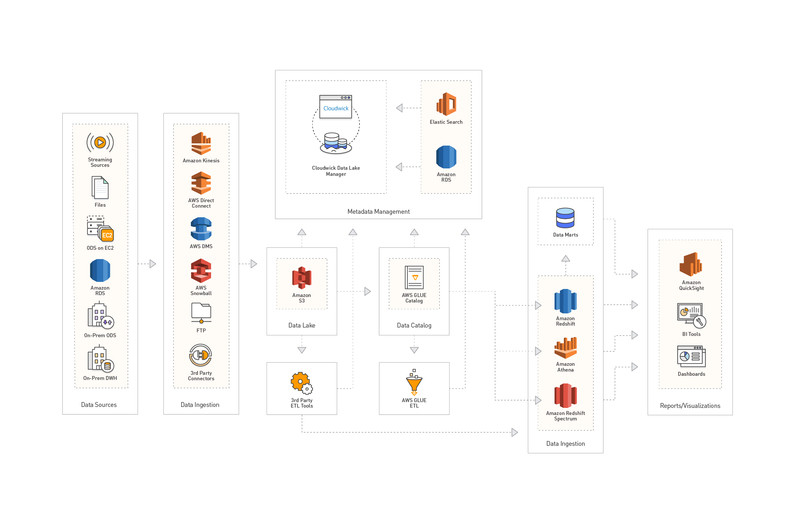 Learn more about Amazon Redshift with documentation, best practices, scripts, and tools.